I used to work with a kindly Indian gentleman by the name of Srinivas from Channai. One day he brought some of his wife’s biryani rice to work and asked me to try it out at home. I shared this incredible dish with my wife and she and I agreed that we couldn’t handle it without a good dollop of sour cream, a full glass of milk, and some bread! Hot, hot, hot! When I told Srinivas the next day, he began to chuckle. He smarted, That is what we prepare for our two-year-old! The following three recipes are dedicated to Srinivas. They highlight the incredible ability of Indian cooks to take very similar ingredients and generate three quite different culinary experiences. I promise, they are not nearly as hot as Srinivas, his wife, or their toddler would have liked, but they still pack quite a kick. Preheat the oven to 350°F. In a mixing bowl, combine rice with 3 cups of water and set aside. In a food processor or blender, purée garlic, ginger, lemon juice, yogurt, and cream. Set aside. Place a large skillet over medium heat. Add the ghee or clarified butter. When it begins to shimmer, add onions, cumin, cayenne, paprika, pepper, garam masala, and turmeric, and sauté for 10-12 minutes, or until the onions are starting to brown. Add potato, cauliflower, carrots, and salt, and continue to sauté for 4-6 minutes, or until the potato begins to brown at the edges. Add tomato, jalapeño, French beans, peas, ¼ cup of the cilantro, and ⅛ cup of the mint, and continue to sauté for 3-4 minutes, or until the jalapeños begin to soften. Add garlic-ginger purée and sauté for an additional 3 minutes. Reduce the heat to low, cover the skillet, and allow it to simmer while you cook the rice. In a separate pot, bring the 2 remaining cups of water, saffron, cloves, cinnamon, and vegetable oil to a boil over high heat. Reduce to low. Drain the soaking rice using a sieve or fine strainer and add it to the pot. Cover the pot and allow the rice to cook for 10 minutes. Discard the cloves and cinnamon stick. Transfer the skillet contents to a baking dish in a single layer. Atop the vegetable mixture, layer the partially cooked rice. Cover the baking dish tightly with aluminum foil, transfer to the oven, and roast for 40-45 minutes or until the rice is fully cooked. Remove the biryani from the oven and allow it to rest, covered for 15 minutes. 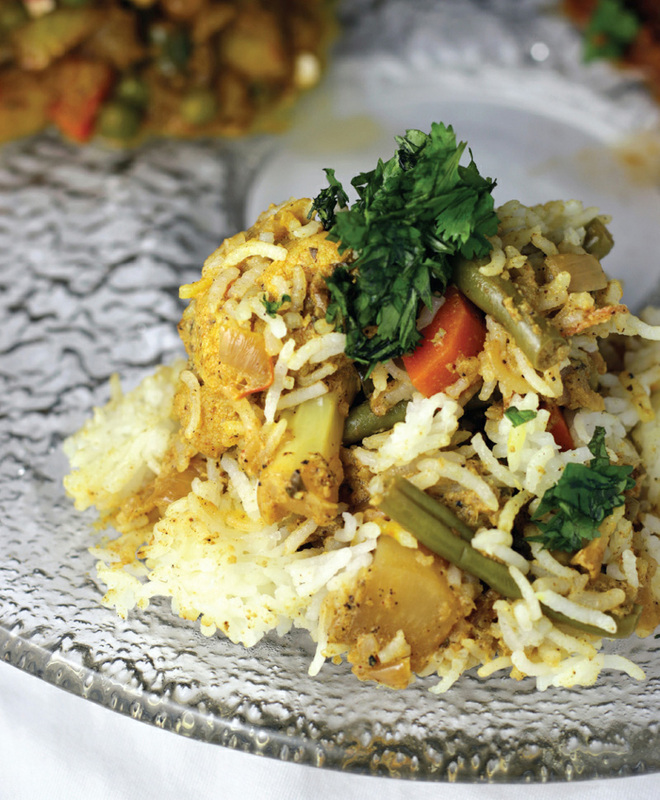 Uncover the biryani, gently stir together the vegetable mixture with the rice, top with remaining cilantro and mint, and serve hot!